Before international fast food chains and gourmet restaurants came by, we, 90s kids, had our darshinis and our Iyengar Bakeries. While the first Iyengar Bakery reportedly opened in the late 1800s, it was in the 90s that they popped up in virtually every corner in the city. And while their numbers have dwindled in their recent past, the awesomeness of their treats have not diminished. 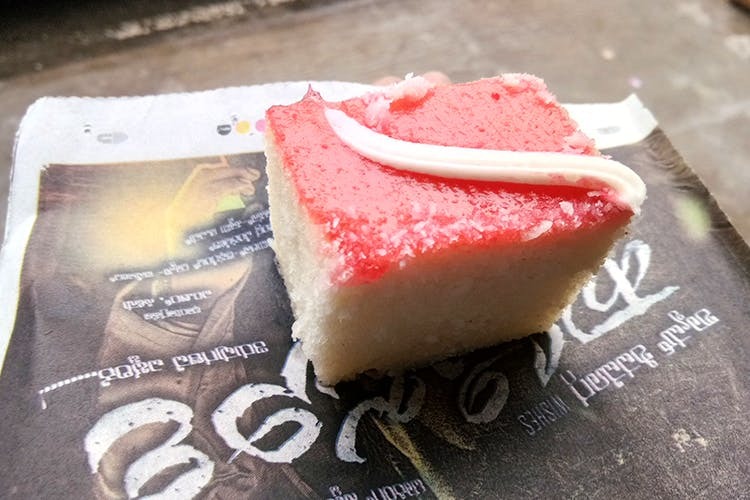 This 90s kid shares her favourite treats from the good old Iyengar Bakery. Flaky, crumbly layered pastry stuffed with a greasy vegetable filling — there’s absolutely nothing that can go wrong with a puff at an Iyengar Bakery. And if it is fresh out of the oven, then, you’ll know that you are biting into a slice of heaven. Known as the poor man’s cashew nut, the Congress Kadle is basically split peanuts tossed about in a chilly and turmeric heavy spice mix. The result is a crunchy, lip-smacking snack that’s perfect for those 4pm cravings or even when you want to down your tipple with something tasty. Slices of downy cake soaked in a sugary syrup and then coated in desiccated coconut. Topped, of course, with a layer of jam and a dollop of buttercream. The honey cake has no honey in it whatsoever but we never hear anybody complaining! Good old salted biscuits that melt-in-your-mouth in a jiffy. There’s no better snack to dunk into your piping hot cup of tea or simply nibble on while you watch the telly. When you want to switch things up and want to chomp on something better than buttered bread, you brought in Iyengar’s masala version to do the trick. Slivers of onion tossed up in spices and garlic before being piled on top of slices of bread. Yum! Has your favourite Iyengar Bakery treat not been listed, then do share them with us in the comments section. You can also order your favourite Iyengar Bakery products online here too!